So here's the kind of scenario I have in mind. You have a Windows Forms project on the go and you want to create a ListBox that has more than just text in it. You want to have an image at the left hand side and two sets of text at the right, each string in a different size font and a different color. Of course you could use Owner Draw, MeasureString, DrawString, DrawImage and a bunch of other hokey stuff to do this in WinForms. And before WPF came on the scene that was all you had in your toolbox. But now that WPF is here you can create ListBoxes that are far more complex than this one. Mind-boggling complexity and knock-your-eyes-out design characteristics, actually. To be truthful though you really need Expression Blend as well as Visual Studio 2008 (or VB 2008) if you want to create anything that has a lot of sub-elements and/or many variations of colors, such as rotated gradients. If you're not ready to abandon Windows Forms totally (and why should you?) then you can get most of the best of both worlds and port those fancy design WPF controls into your Windows Forms. On the assumption that not everyone has Blend or the full edition of VS 2008 I'm going to limit the ListBox to something quite basic and will leave it to you to take it from there upwards in the design stakes. The demo project for this article is written using VB 2008 Express Edition. This article isn't going to be a full primer on creating WPF controls, but I hope to show you enough detail for you to be able to try the approach out yourself - pushing the envelope as your WPF knowledge grows. Start up a new Windows Forms project. Add a Panel to the default Form1, set its Dock property to Right. Set its Width to 300. Go the Toolbox and find the WPFInteroperability Tab. Open it and select the ElementHost control. Drag it on to the form and drop it inside the Panel. The Smart Tab dialog will open and invite you to SelectHostedContent from a combobox. Of course, at the moment, the combobox will be empty as we haven't reached that stage yet. But before you close down the SmartTab, do select the Dock in Parent Container checkbox. That's all we need do with the WinForms project at this stage. The next step is to add a WPF User Control Application to the Solution. Now, if you are using the Express Edition and you don't see the name of your Solution at the top of the Solution Explorer then you need to make a change to your IDE options. Go to Tools > Options in the IDE Menu and select Projects and Solutions > General. Over to the right hand side list of checkboxes you will find "Always Show Solution" as an option. Check this option and the Solution name will be displayed in Solution Explorer. 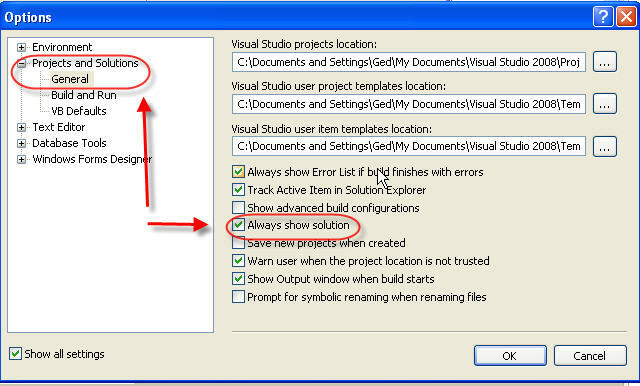 Right click on the Solution name in SolutionExplorer and from the context menu that appears select Add > New Project. 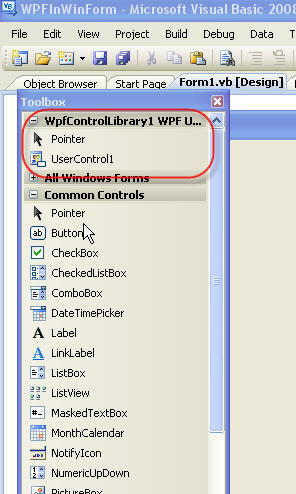 Select the WPF User Control Library template and click to add this to the Solution. 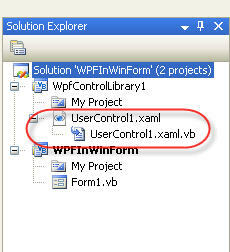 You will see that a new project with a default UserControl file pair (xaml and xaml.vb files) will have been added. 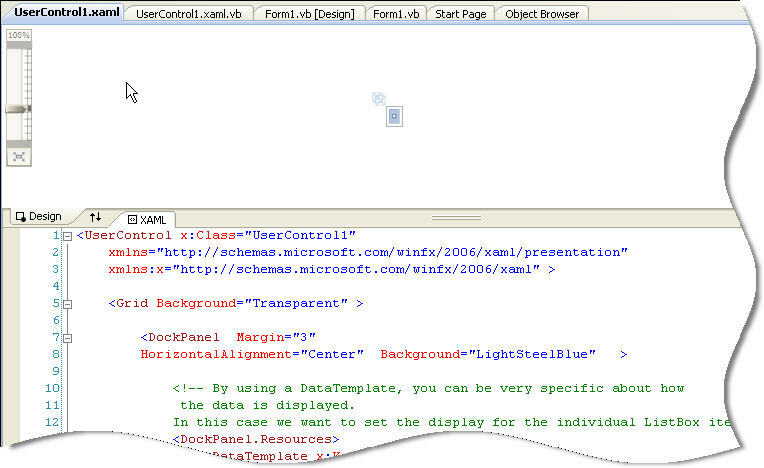 The next step is create the XAML Markup for the ListBox UserControl. For the purposes of this article I'm going to begin by showing you all the XAML so that you can simply copy and paste it from this article into your project. On the following pages I will walk through that markup and explain how it works in some detail. If you try and copy paste from the above screenshot, sadly you will be disappointed. The reason that I have gone the screenshot route is not to make life difficult for you. The problem is that for some reason I just can't get the Article Editor we use here on devCity to behave itself and display the XAML correctly. So here's what I've done as an alternative (before you lose patience and give up, as I almost did!). I have attached a text file to this article that contains all the above markup. It is named UserControl1.txt. (I won't bore you with the reasons why I haven't made it a XAML file). All you need to do is download this small file, open it in Notepad or Visual Studio, copy all the content and paste it into the default UserControl1.XAML file in Solution Explorer, ensuring that you delete all the original default code from that file as you do so. Once you have pasted it in, the IDE will instruct you to Reload the Designer, which you do by clicking on the message bar at the top of the IDE Designer pane. 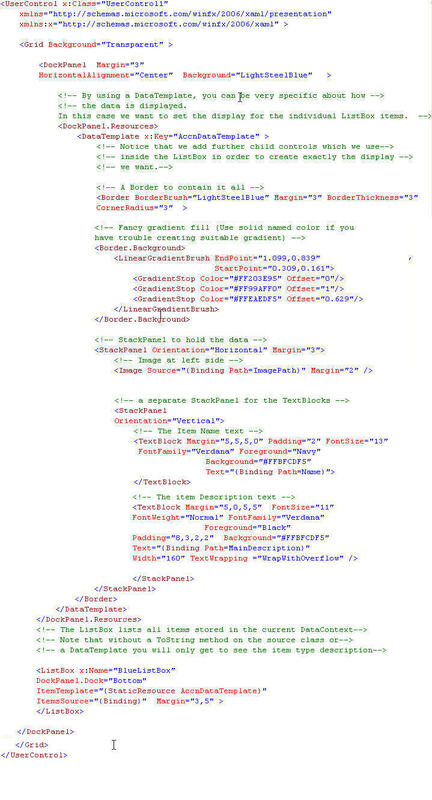 Because there is no data to display, you might be perplexed by what you see in the Design pane in the XAML file. It hardly gives you any idea of what the finished product will look like, does it? But don't worry, once we wire it up with some data and display a complete ListBox in our WinForm it will all fall into place. It would be perfectly possible for me to create the data inside the UserControl itself. But if you were planning to go to the trouble of devising and creating a DataTemplate it makes more sense (and is good practice) to separate the UI from the data source. So what I've done is create a simple class that creates and returns a bundle of relevant data. 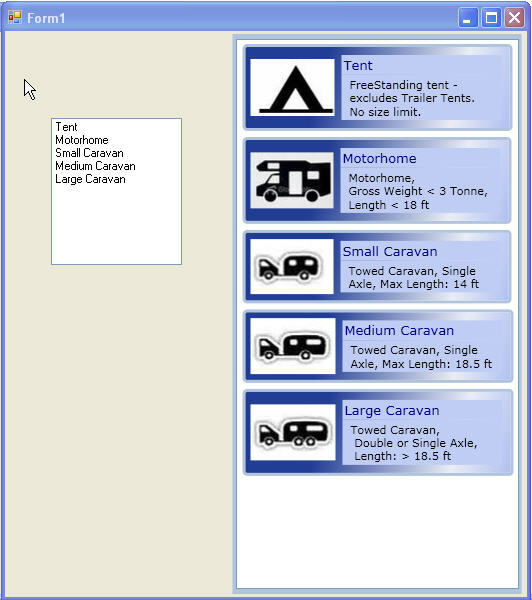 The scenario for this particular project is that the listbox will contain images and text that represent different types of camping accommodation, so there will be data on tent, caravan, etc. The class I've created for this data is called the Accommodation class. Here is the code, which you will need to add to the WPFUser Control Library project in a separate class file, just as you would add a class file to any .NET project. I'm sure you'll be pleased to know that you can just copy and paste the above code if you want to. As with the XAML, if you need a walkthrough explanation of what it does, then I will be covering that on the following pages. For now, we just want to see that it all works! That said, it won't actually work until we add the image files to the project and also link the data source to the ListBox. The images I have used are available as a downloadable zip file (or you can grab them from the demo solution which is also available with this article). Create a new folder named "Images" in the WPF UserControl Library project in the Solution Explorer. Right click on the project name and select Add > New Folder. Once this folder appears in the Explorer's list Right click on the folder name and select Add > Existing Item. You then navigate to where you have saved those images and select them. If you're new to all this you might be thrown by the fact that the images don't seem to be where you know you saved them. This problem is easily resolved. You need to ensure that "Objects of Type" in the Add Existing Item pane is showing "All Files" (the default is vb files). You can use Shift-Click to add all the files in one go. Once they are visible in Solution Explorer, select them all - again you can use Shift-Click. Move your mouse down to the Properties Window, ensure that the Build Action is set to "Resource", then click on the next item down (Copy To Output) and set this to "Copy If Newer". Before moving on, run the Build > Rebuild Solution option from the main IDE menu. We have all we need now, so it's time to wire up the WPF and Windows Forms projects together. Go back into the WinForms project, right click on the project name and select Add Reference. Once you get the Add Reference screen up, select the Projects tab and click on the WPF UserControl Library1 and close the screen. If you check out your Toolbox, you should see that the UserControl is now available there, (although you may need to rebuild the project again first). So you could drag the user control on to the form and drop it in the ElementHost. However I am going to recommend that you don't do that, and instead suggest that you create the control in the code behind. Rebuild it one more time and run it and if everything has gone to plan you will see the WPF UserControl sitting quite happily on that Windows Form. You can drag Windows Forms controls on to the form, although you can't have them overlapping with the WPF one. Because this amalgamation of the two technologies is something of a fudge, it isn't perfect, but it definitely does open the door to much more interesting GUIs in Windows Forms, with far less effort, than was previously possible. With this particular WPF control on my mid range system, for example, I did notice a short delay while the UI was rendered. If this is a problem that you want to deal with, then there are several workrounds and I have included some in the downloadable demo solution. On the next page I will look at the markup and the code and walk through the key things you need to know to create similar WPF UserControls and have them hosted in Windows Forms.